As Battlefield 5 begins to make its way into the hands of PC and console players everywhere, the unconvinced may be wondering whether DICE's WW2 sequel can really live up to the legacy of the multiplayer shooter series. Well, what better way to find out for sure than by ranking it next to every instalment in the franchise so far? Below, we've listed each Battlefield instalment in order from worst to best, recently updated to include our verdict on where Battlefield 5 ends up in the hierarchy. As with any list of this kind, there's bound to be debate over which game should go where, but we think we've found the right balance by giving each title its fair due, controversy be damned. Take a look for yourself, and see where your favourite Battlefield game has ended up. I’d imagine that you, dear reader, probably haven’t heard of Battlefield Online until now. Consider yourself lucky. The free-to-play remake of Battlefield 2 was developed for the East Asian market by the relatively unknown Neowiz Games, with little input from DICE, and its only real selling point being that up to 100 players could now duke it out on classic Battlefield maps. It was a perfectly fine and functional manifestation of a Battlefield game, despite the uncharacteristically ugly visuals, but stand Battlefield Online next to Bad Company 2 - which came out in the same year - and there’s not even a comparison to be made. The servers were shut down in 2013, after years of all too consistent technical wobbles, so you couldn’t even play this one if you wanted to. Probably for the best, aye? Some people must have clearly loved Battlefield Play4Free, as a petition to save it after EA announced it would be shutting the servers down gained nearly 50,000 signatures, and there’s even an fan-made spiritual successor in the works called Project Fury. But the best thing about Battlefield Play4Free was, honestly, that it was completely free, making it harder to fault despite being nothing more than a mediocre imitation of Battlefield 2. Aside from the unpleasant graphics, lifeless settings, and serious lack of features like the ability to switch characters, Battlefield Play4Free suffered from an identity crisis. What was it, other than a bland, insipid amalgamation of a million other shooters set in the contemporary war theatre? It may have been a no-cost alternative to its AAA brethren, but first person shooter fans could still have done a lot better than Battlefield Play4Free. Turning the Battlefield series into something that resembles a Saturday morning cartoon for children sounds like an… unwise choice for an IP that typically deals in mature, violent themes. But, through some sheer miracle, DICE successfully jumped the shark and landed on the other side with Battlefield Heroes, a free-to-play PC title that demanded little technical horsepower from players’ desktops. Looking back at it now, Battlefield Heroes almost seems like a latter day Fortnite and, in a way, that’s exactly what DICE was going for, at least in terms of spirit and art style. This was smaller in scale, happier in tone, but still somewhat competitive for those who wanted to sink their teeth into it, making Heroes a pocket sized delight for the fan who was willing to try something new. Sadly, EA mutated Battlefield Heroes into something that resembled a pay-to-win grindfest in its latter days, before shutting it down for good in 2015. The only AAA Battlefield entry not to be developed by DICE, the now defunct Visceral Games tried out something radically new with Hardline, introducing a cops and robbers element to the standard Battlefield formula with limited success. Battlefield: Hardline’s attempt to ape serialised crime shows in its campaign was admirable but clunkily executed, especially as its story recklessly glosses over the political sensitivity of the subject matter with little in the way of diplomatic subtlety. Meanwhile, multiplayer simply lacks the finesse of other instalments. New, crime-themed modes are hit and miss, with Hotwire standing out for all the wrong reasons as an arbitrary and totally redundant facsimile of cinematic car chases. There’s definitely spots to appreciate in Battlefield Hardline, but as a whole, this is a brash misstep into unearned territory. How could a Battlefield game with hover tanks and fighting mechs possibly go awry? Well, it it didn't help that Battlefield 2142 came out just a year and four months after Battlefield 2, and those sci-fi standbys that sound so bulletproof now lent it a gimmicky image for people who preferred the more grounded (literally) feel of previous Battlefields. It was unfortunate, because 2142 really was a solid game - expanding on the new mechanics of Battlefield 2 with faster combat and a more varied arsenal. Not to mention the still-whispered-of greatness that was Titan, a new game mode that had players fighting to control missile solos on the ground then board the opposing team's Avengers-style hover carrier. Thankfully, Titan found new life in Battlefield 4: Naval Strike's Carrier Assault mode. Battlefield Vietnam seemed strange when it came out and it's even more odd in hindsight. The biggest selling points the sophomore Battlefield had over its predecessor were a) asymmetrical warfare between forces with very different equipment and fortifications, b) helicopters that only required days rather than months of practice to be useful (that's right, I'm looking at you, prototype chopper from BF 1942: Secret Weapons of World War 2), and c) vehicle radios that could blare ‘Surfin' Bird’ as you rode your scooter into combat. Keep in mind that we were still just shy of 30 years away from the end of the Vietnam War when Battlefield Vietnam came out - uncomfortably close for such a devastating, divisive conflict. The whole thing was probably a bad idea… but it was still fun to play. This console spin-off from the core Battlefield series was, shall we say, quite experimental. It appeared during the transition period between the PS2 generation and the Xbox 360, so was available on both older and newer consoles. The result is that it varied in quality and intent - the 360 version is a polished translation and actually stands up pretty well as a Battlefield game. The core gimmick here is that the solo campaign allowed you to hotswap between soldiers, essentially zipping across the battlefield like some kind of ghost, and possessing the body of a different grunt. It kinda worked, but gameplay often felt a little jumbled and disjointed (although there are smart moments contained within the mechanic). With 24-player online modes, which were largely forgettable, this was a recognisable Battlefield game, but very much a poor cousin to Battlefield 2 which never appeared on consoles. In terms of content alone, Battlefield 1943 is very, very small. It features just a handful of multiplayer maps, vehicles, and weapons, with no single player experience to speak of whatsoever. But that didn’t matter, because what was there was one of the most enjoyable multiplayer FPS experiences that you could hope for, and a game that was one of the first to exemplify the benefits of a digital market. The sum of many parts, Battlefield 1943 is reputable for its memorable setting, sun-kissed scenery, and that music… by mother’s mercy, that sweet music. The iconic main theme, a stirring string rendition that perfectly bottles the romanticised fantasy of military life, is still stuck in my head to this day. Taking all of that together, 1943 is classic Battlefield distilled into its purest form, offered up on a plate that few can refuse, sizzling with visual dazzle and historical heft. With the foundation for a new era of Battlefield laid out by Battlefield 3, DICE’s hasty follow-up is essentially more of the same, only better. The campaign is an improvement, but that’s not saying much, and you’ll likely have forgotten all about it by the time you’re knees deep into Battlefield 4’s much upgraded multiplayer content. Console owners could finally appreciate the joyous chaos of 64 player matches, and the Levelution effect - in which huge parts of each map could be drastically changed by weather and player activity - is still as impressive to watch as when we first laid eyes upon Siege of Shanghai’s collapsing skyscraper. Sadly, launch day troubles soured public opinion on the game for quite some time, its best qualities blighted by crippled servers and bugs aplenty. Battlefield 4 has come a long way since then, but we can't ignore the shadow of its false promises, hence its somewhat diminished position on this list. There's a lot to love about Battlefield 5. It's systematic, meticulous approach to subtly reworking multiplayer leads to some of the finest gunplay experienced in an online shooter to date, while the presentation has never been better thanks to detailed animations, state of the art technology, and a rousing, monumental original soundtrack. But this isn't a Battlefield for everyone. 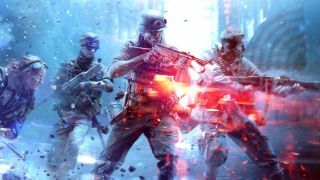 By widening the skill gap and dialling down the spectacle, Battlefield 5 obfuscates the primordial craze of its predecessors for something a little more muted and a little less distinctive against the range of other shooters on the market. Your conclusions about Battlefield 5 will ultimately depend on what you want from a Battlefield game, but it's hard to deny this instalment lacks that special X factor compared to the higher ranking entries on this list. Many fondly remember Bad Company 2, but few talk about the original with quite the same enthusiasm. Shame, because it was the prototype for most things that made the sequel so brilliant. It was one of the first Battlefield games with a proper story, with characters (who are funny, genuine human beings) and a plot, and it represents the first use of the now legendary Frostbite engine in the Battlefield series. The result was levels of destruction we simply hadn’t seen before, and that makes it a landmark game. Sadly, DICE’s lack of experience in crafting a solo campaign was exposed too, with occasionally poor AI and some strange control options (that didn’t quite translate from multiplayer) spoiling an otherwise excellent experience. Multiplayer was a sticking point too, as the game only shipped with a mode called Gold Rush (a prototype of the new classic Rush mode). Fan requests saw Conquest added afterwards, but the real strength of Bad Company always remained the single player.